Adding a game to your training will add interactivity and engage your learner. The context of a game tends to be more interesting because at each stage a learner must overcome a challenge, which keeps the learner motivated. If you want to add a game to your training, find one that works best with your training content. For example, if you want your learner to memorize facts, add a flash card game to your training. In the following section, I describe different types of training content, suggest game types, and show where to find them in Raptivity. Facts such as policies, product specifications, or laws are learnt best using questions, memorization, association, or drills. Best games types are flash cards (Raptivity Zest) and Snakes and Ladders with Questions (Games TurboPack). Skills such as interviewing, teaching, or selling are learnt best using imitation, feedback, coaching, continuous practice, and role playing. Best games types are role-play games like Role-based Individualized Simulations and Simulated Situation with Text and Image (Raptivity Booster Pack 1). Best game types are role-play games, strategy games, detective games, such as, Goal-Driven and Explorative Immersive Learning Situations (Simulations TurboPack) and Selection Strategy (MindPlay Turbo Pack). How people learn, scientific theories, religious theories are learnt best using logic, experimentation, and questions. Strategic and tactical thinking and analysis are learnt best using problems and examples. Best game type is a puzzle, such as, Jigsaw Puzzle – Advanced (Raptivity Essential). Engineering, medical, or IT procedures are learnt best using imitation and practice. Best game types are timed games, role-play games, simulation, such as, Wild Cards – Time Bound (Raptivity Essentials) and Goal-Driven and Explorative Immersive Learning Situations (Simulations TurboPack). Business terms, foreign language, industry-specific terms learnt best using imitation, continuous practice, immersion. Best game types are role-play, flash cards, such as, Goal-Driven and Explorative Immersive Learning Situations (Simulations TurboPack) and Flash Cards (Raptivity Essential). I’d like to end this blog by proposing a game to you, the Raptivity Blog readers. If you’ve used a Raptivity game in a unique way, send me <janhavi@harbingergroup.com> the details and a screen shot. I’ll share what you send in a future post. 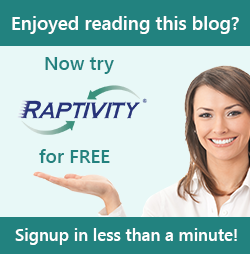 The first 10 Raptivity Blog readers to respond will win a $10 Amazon Card!